What is Brand Culture ? Since we’ve started working on brand content in 2007, we realized that many very important components of brands and of their communication cannot be called content. Brands’ worlds are also composed of essential elements which cannot be expressed with words but have to be taken into account : the sensory, corporal, physiological, cognitive, technological, collective, social dimensions of brands. The noise the Nespresso machine makes, the gesture one adopts to make his coffee or what the coffee capsules become are all part of Nespresso’s cultural universe. through its innovations, it itself produces cultural effects, it makes lifestyles change, creates tomorrow’s trends. How to evaluate the success of a brand’s culture ? The aim for a brand is to create a strong and consistent ensemble which is immediatly comprehensible by direct intuitive intelligence. According to Inès Thoze, a brand can be evaluated by its vibration potential, by its capacity to resonnate with our brains, which are electrical, chemical and magnetic systems, and likely quantic as well. Colors, materials, lights, sounds and the product’s environment are all critical in brands’ cultures. What’s at stake for brands is their semantical consistency, their capacity to give meaning and sensations to their customers. What should be the place of cultural strategy in a company’s management ? Brands’ cultural strategies are of paramount importance : their shouldn’t be dealt with only in parallel of the brand’s marketing strategy. Is is THE strategy to manage a brand. Grant McCracken asks for CCOs (Chief Cultural Officers, or vice-president of culture) to be created in every company. As for Tim Leberecht, he asks for the creation of Chief Meaning Officers. 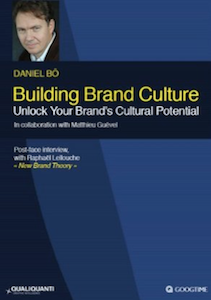 WHAT CAN QUALIQUANTI OFFER TO BRANDS WHO WISH TO DEVELOP THEIR BRAND CULTURE ? QualiQuanti carries out Brand Culture® Audits to help brands determine what they should integrate to their culture. More and more, for rationalization and comprehension sakes, big companies cut studies into separate sections in order to apply rigid models to them. The problem is that these models are often simplistic and impoverish study results. Far beyond consumer studies or brand funds analysis, companies can therefore benefit from doing cultural researches on their brands.